The most annoying thing as a consumer is to find out that you got ripped off while buying something. Whether it’s overpaying for an item or buying something that’s defective, the resulting feeling of bitterness is similar to that of eating spinach as a kid. Two out of three people experience this crappy feeling when they buy a car -- they feel like they got ripped off because they don’t know what is the real price for a car. There is no actual price reference that can be used as an accurate basis for comparison; instead there’s just pricing estimates and numerous opinions. With the launch of PriceHub, we are looking to turn the car shopping experience upside down by revealing the actual prices paid for every single vehicle. Armed with this information and data, consumers can feel confident negotiating any car deal because they will know what Jim, Bob, and Mary actually paid for that same exact vehicle. 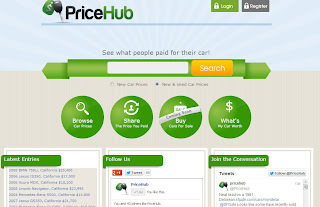 PriceHub has aggregated millions of pricing & research data from DMVs, dealers, and private individuals across all 50 states to provide the best and most accurate database of actual car prices, and we invite you to check out the data on our site and see how we are changing the car shopping experience. For example, you’ll be shocked to learn that KBB’s pricing estimates could be up to 11% higher than what people actually paid for a car. Wouldn’t you want to know this?